This last weekend I was in a wedding for my good friend Holly. It was beautiful. Exactly what you would dream up for a fall wedding. Hot cocoa, leaves blowing magically in the wind, and love in the air. 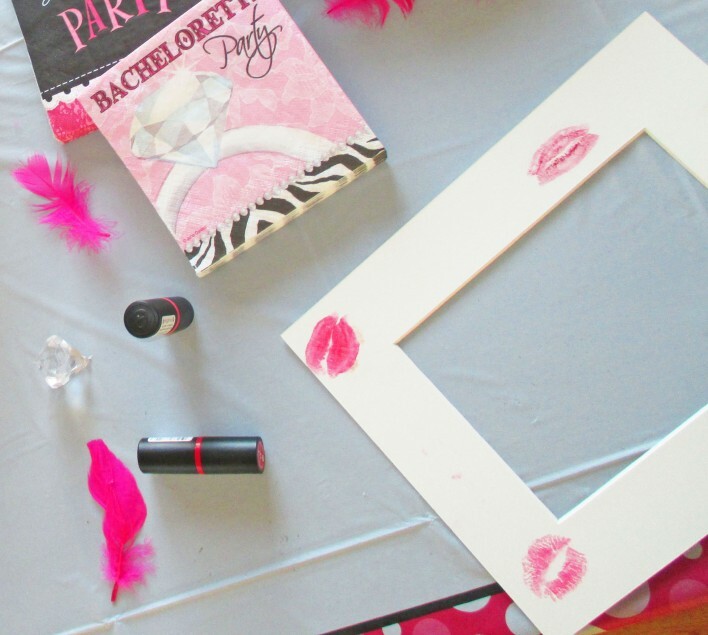 Being a bridesmaid, I got to help in planning the bachelorette bash! 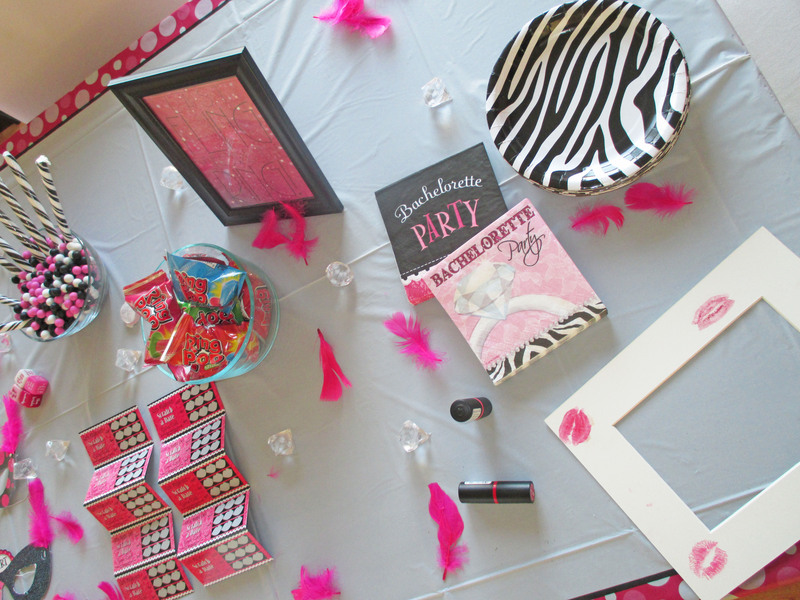 I’m one of those weirdos who thinks planning is part of the fun:) I partnered up with Holly’s sister, and together we threw a fun and girly party for the bride-to-be! We met for coffee a couple times and hammered out the deets. I spent a lot of time searching the web for cute and affordable invites, and unfortunately it was a lot of wasted time. I couldn’t find anything I liked under $2 an invite! 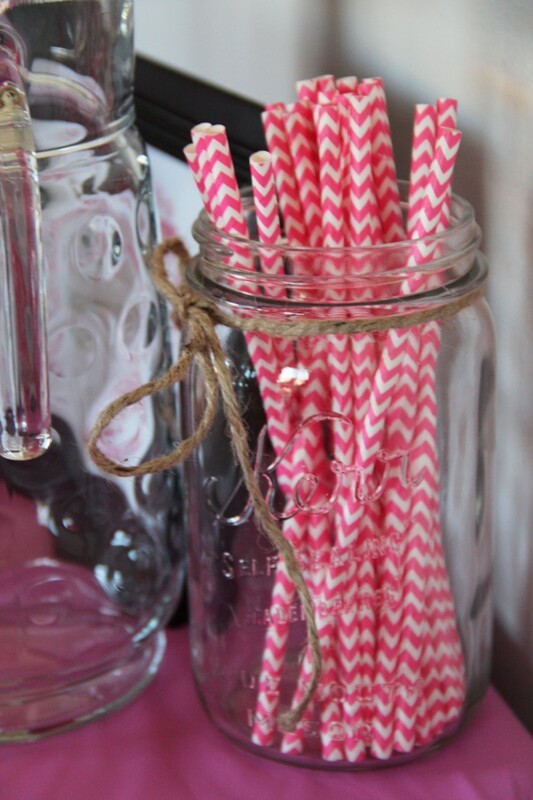 I finally just decided to DIY them. 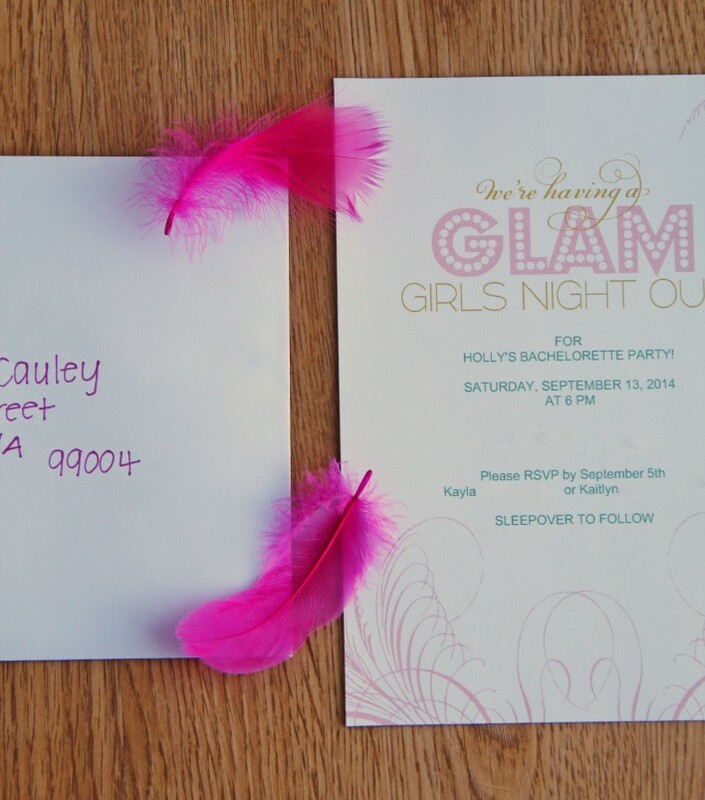 You guys, this free printable invite is the prettiest most fun invite ever! Plus, there are different color options! Don’t mind the large blanks where the address and phone numbers are. I had to edit those out. This is the internet, after all! 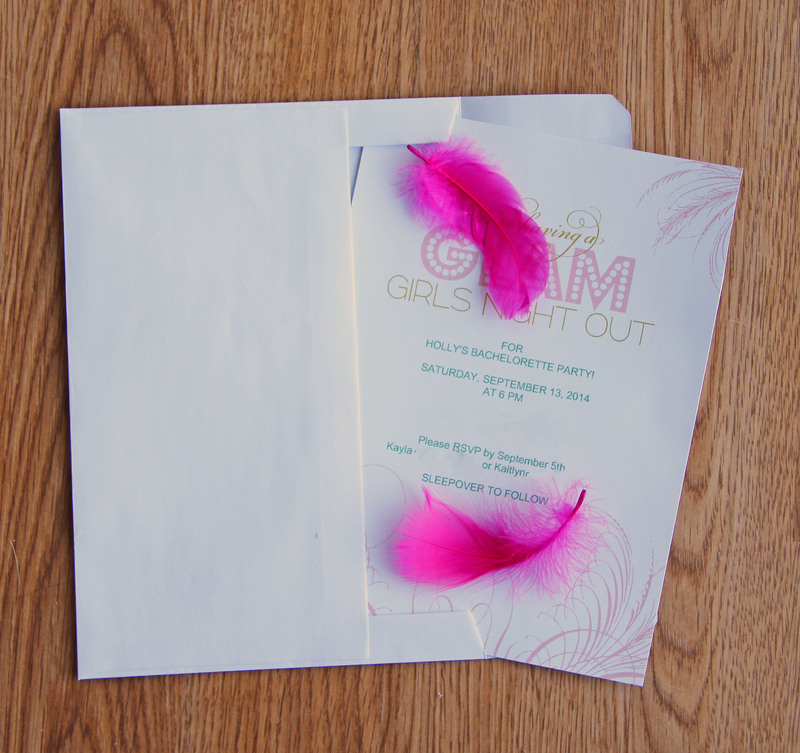 But anyway, I had everything at home to make these fab invites except for the feathers! (Which I got for $2.50 at a craft store in town.) Envelopes and envelope seals I had leftover from my mom’s surprise 50th– which I also DIYed the invites for… And I already had cardstock and printer ink. 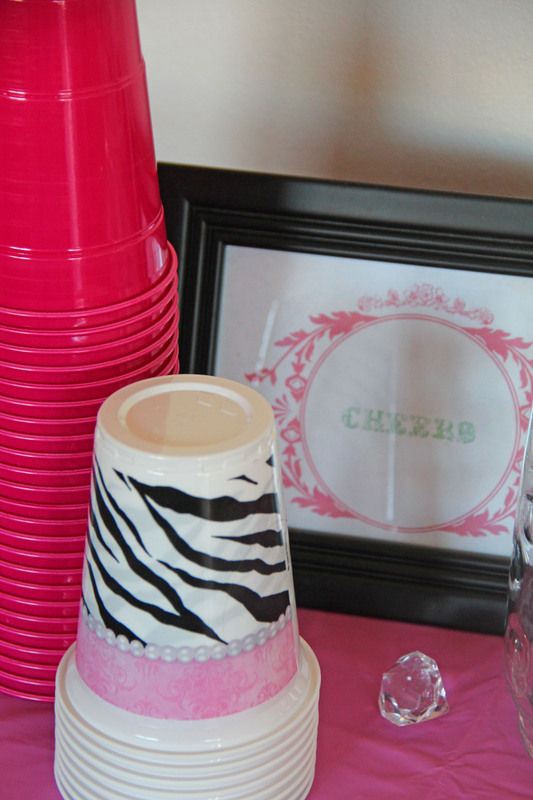 So once I found the perfect free printable, I was ready to go! 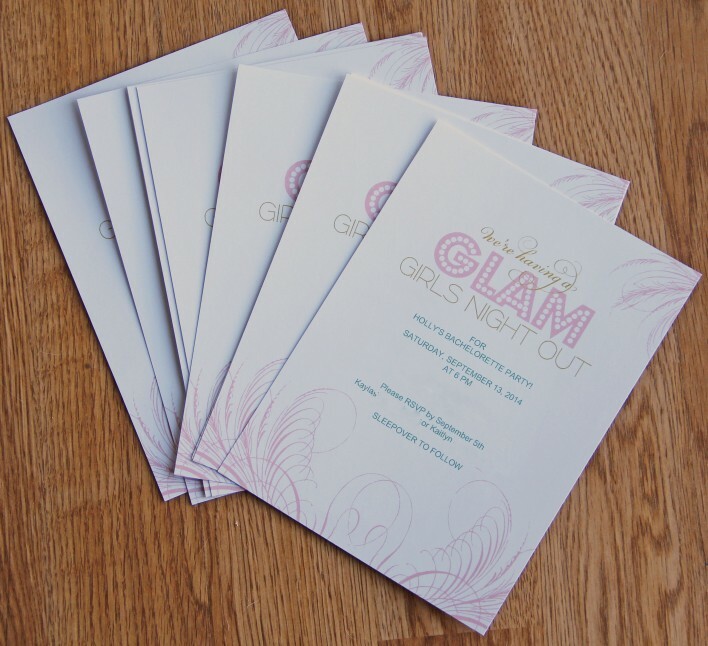 I used my sis-in-laws paper cutter to cut them out too which was key. Free handing these would not have gone over well! 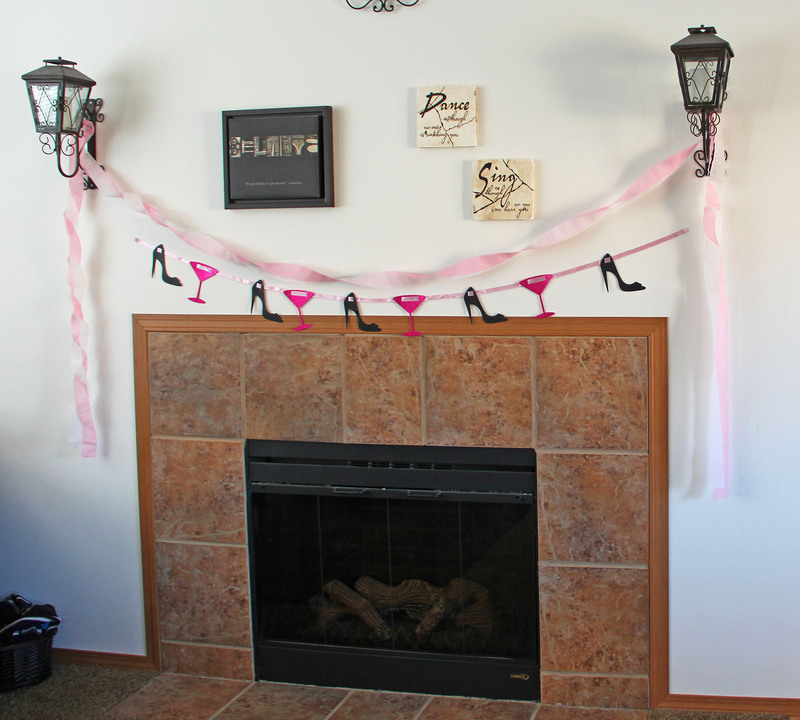 We didn’t really have a theme or anything, so we just kept with the standard girly decor- since it was girls night out. How adorable is this banner that Holly’s sis found?! Love! 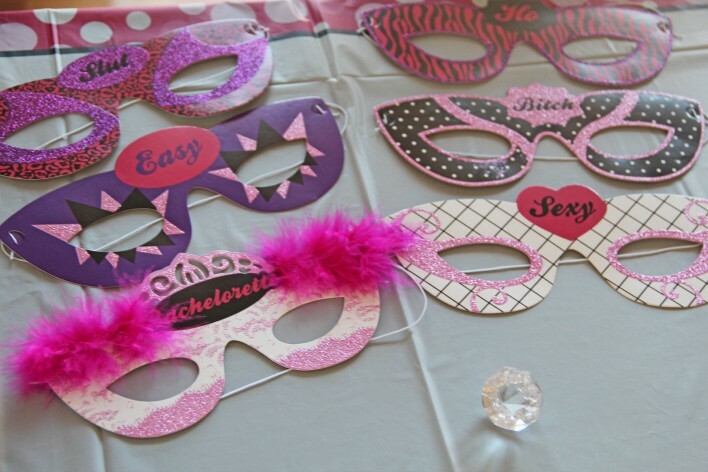 I customized these printables from weddingchicks.com – if you haven’t been to this website for free printables yet you are missing out! 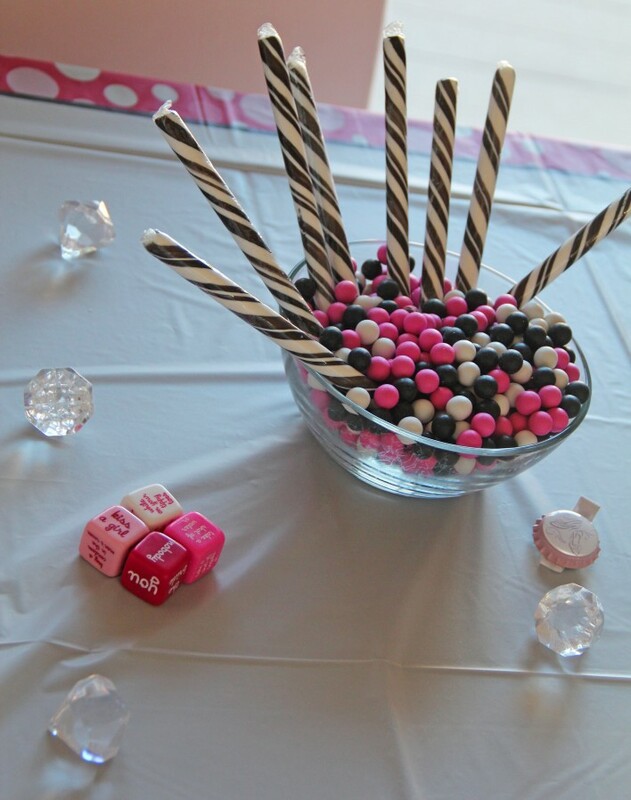 Details are one of my favorite things to plan for an event. 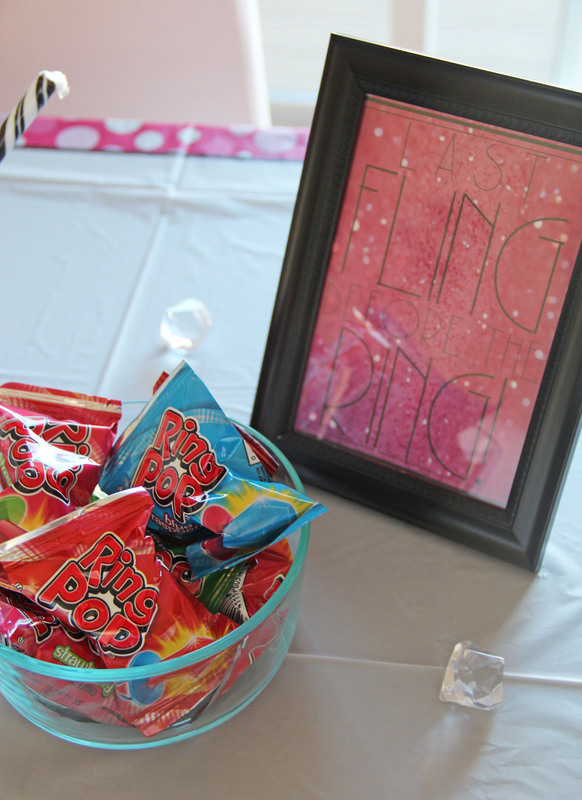 I found this awesome “Last fling before the ring” printable via Pinterest- which I framed and placed next to a bowl of ring pops. 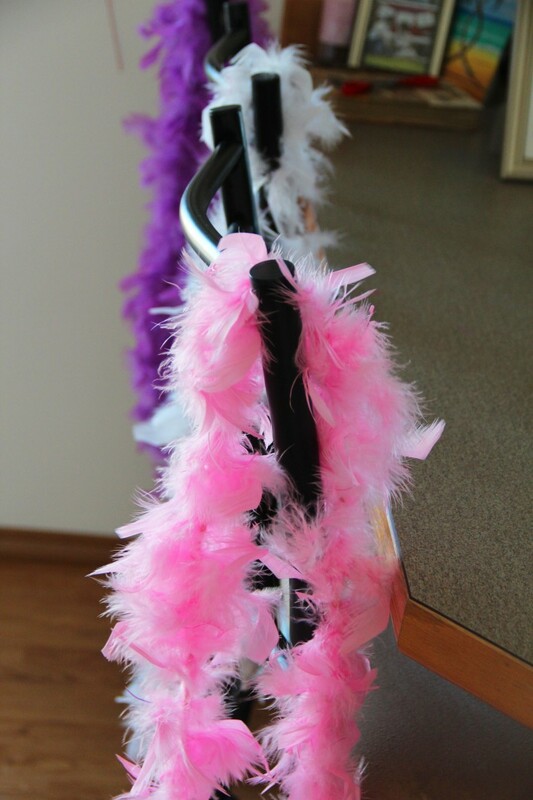 We had boas and masks to wear. 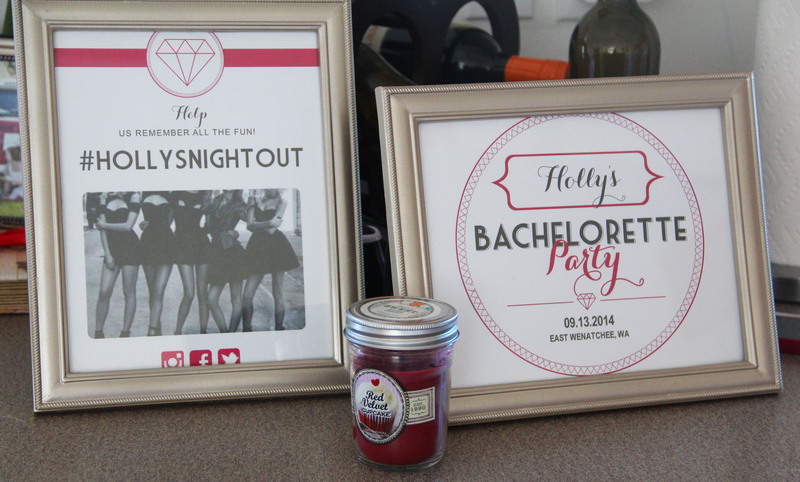 We also all kissed the matte from a frame for Holly- for her to frame a group picture from the bachelorette party! 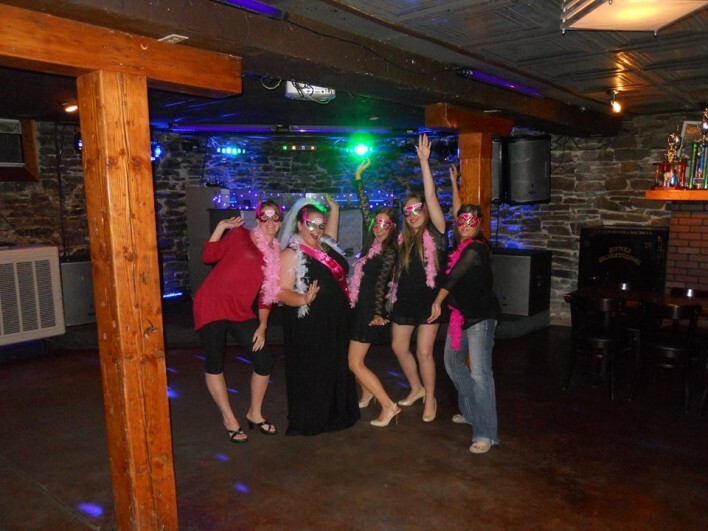 And of course we had a pink “bride to be” sash for the bachelorette! The plan was to go out for drinks and apps, so we had simple munchies for before. We picked up some baked potato chips (love the crunch of baked chips! 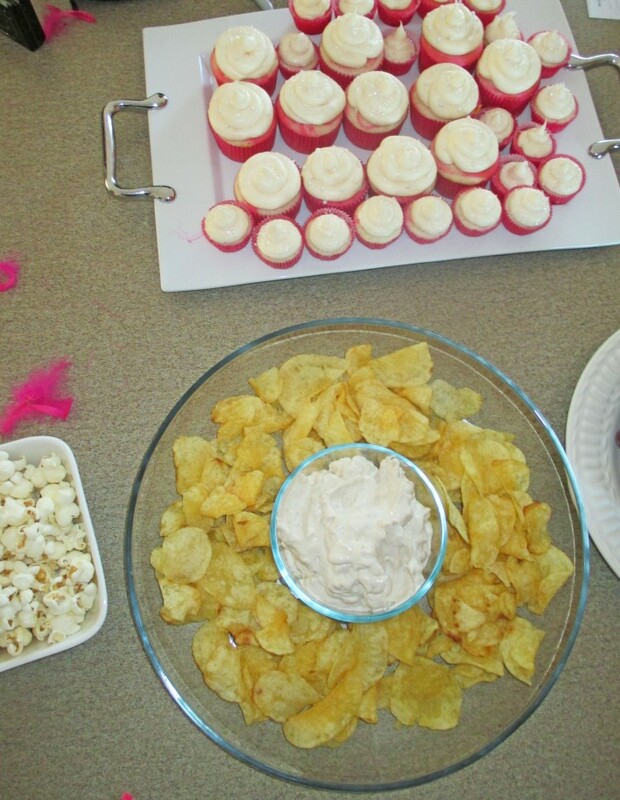 ), french onion dip, white cheddar popcorn, grapes, and mini cupcakes. 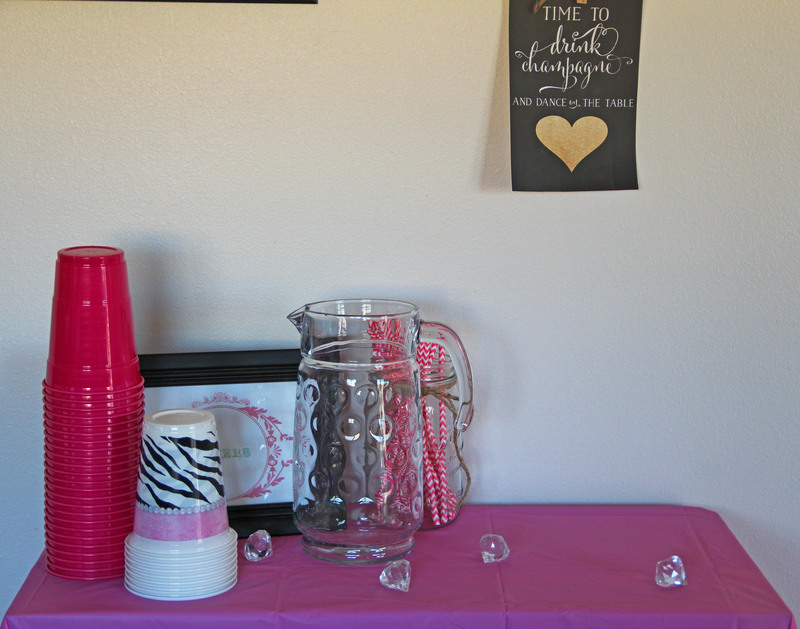 To drink we had the delicious combo of moscato, sprite, and pink lemonade. SO good! Sorry guys, I didn’t get any pictures of our beverage, but trust me- it was amaaaaazing. Super refreshing- we all LOVED it. Here’s the recipe we used! At my house we played “pin the junk on the hunk.” Seriously. It was hilarious to say the least. We had to do something slightly embarrassing for the bachelorette! 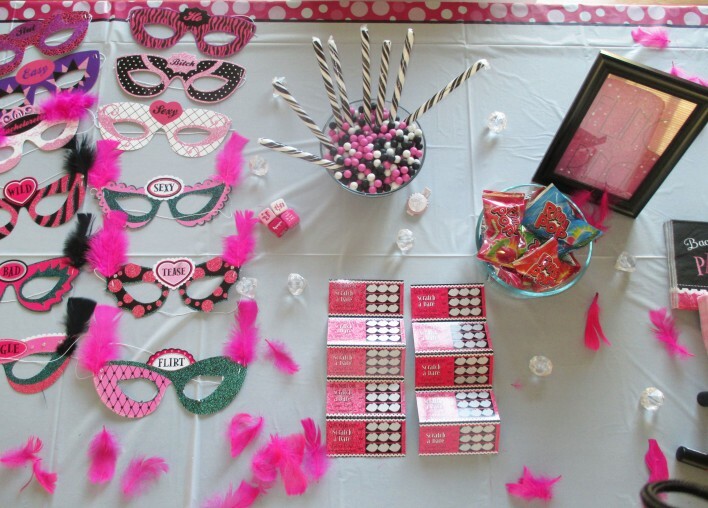 We also had girls night out scratch tickets, some girls night out dice, and an awesome scavenger hunt for our night out. After snacking, sipping pink wine punch, playing pin the junk on the hunk, and taking lots of fun pictures- we headed out to get our night out started! We first went to a local restaurant for appetizers and drinks. 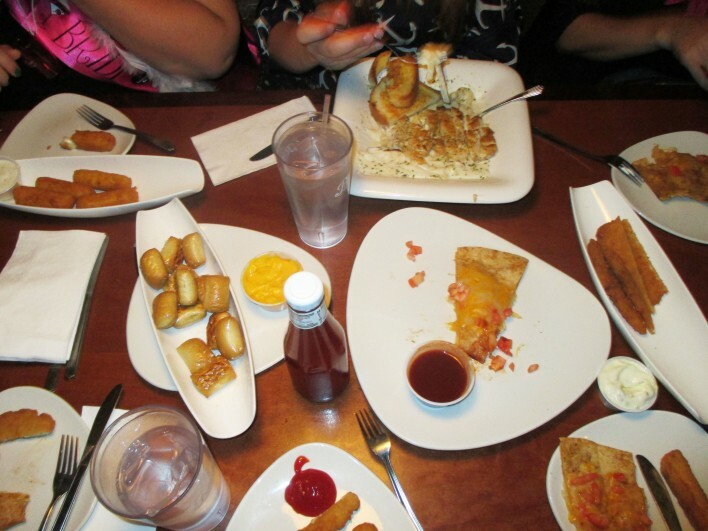 It was perfect, we each ordered a different app & we shared everything. That’s the way to do it! Next, we headed out to get started on our scavenger hunt. I’m pretty sure we did almost everything on the list, and we all had a great night celebrating Holly’s last hoorah as a single lady. It was a great group of girls too! So fun! After our scavenger hunt shenanigans, we headed back to my house for late night munchies and a movie. It was such a blast! 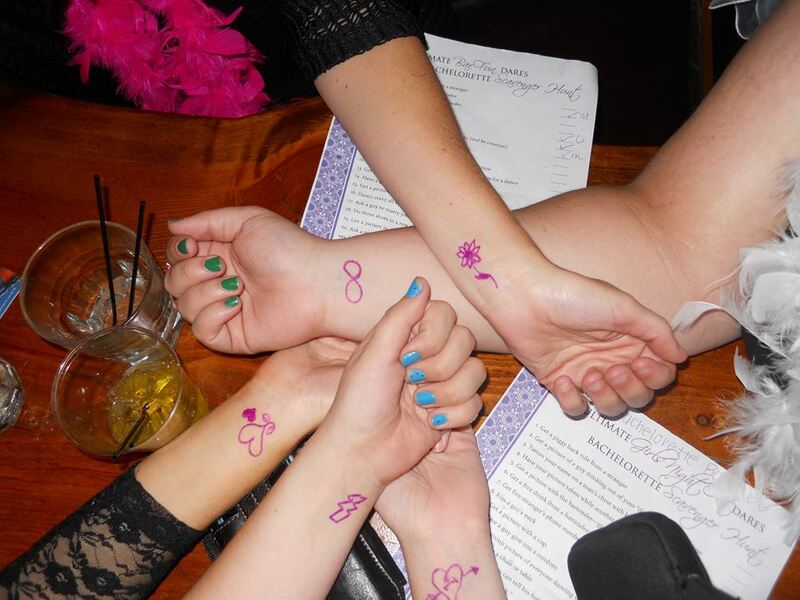 Definitely a memorable night! 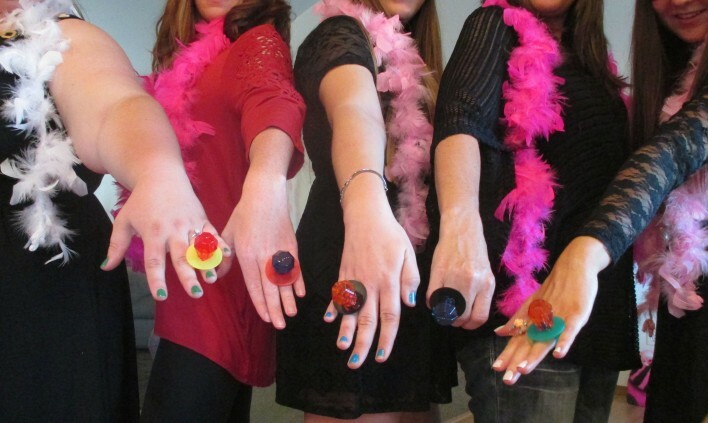 Have you been to a memorable bachelorette party recently?